A man was beaten and carjacked Friday evening just three blocks from where another carjacking attempt failed on Tuesday morning, according to police reports. No one is in custody. Concerned drivers later reported seeing the vehicle traveling erratically on southbound Clark Street near Wrightwood, but police were unable to catch up with the stolen car. Police did not provide a description of the offenders. Tonight’s carjacking unfolded near the scene of another carjacking attempt that CWBChicago told you about this week. 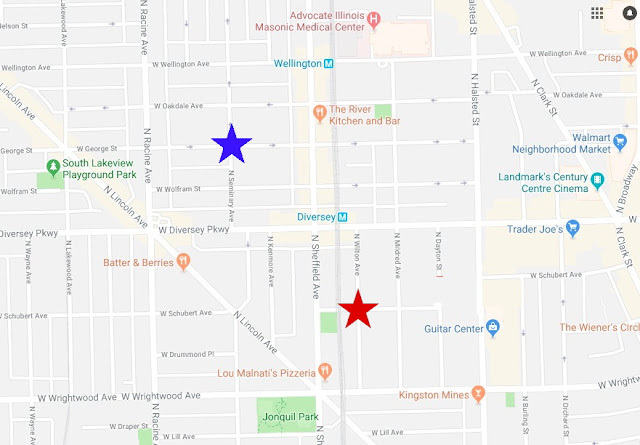 In the earlier incident, a man who lives in the 1100 block of West George Street told police that he was approached near his home by a gunman who tried to take his car shortly before 5 a.m. on Tuesday. The robbery failed, although a police spokesman was unable to provide details of how the carjacking fell through. The getaway car used on Tuesday was a green or gray four-door 2018 Dodge Charger with a dent on the rear lower panel of the driver’s side. It bears a California license plate that begins with “8CUB.” The vehicle was reported stolen in Chicago on Dec. 1st, according to police. According to Tuesday’s victim, the primary offender was a black male who stands about 6-feet tall who was wearing a gray hoodie.